Almost all the great inventions, unfortunately, have their pros and cons, the examples are many. And the Internet is no exception. However, as Albert Einstein stated, inventions are not in itself good or bad, everything depends from the use we made of it. But is it really so? The answer is not simple. The use made of the new inventions depends on people, but... with no doubts, some of the features or functionalities of these inventions make them more or less attractive to the masses. The Internet has many of these features. For example, the Internet is easy to use, is within reach of a click (if for surfing you’d need to introduce a series of complicated codes there would be fewer people addicted to the Internet). At the same time, the Internet has an attractive interface (if we could surf the Internet only in front of a black display with green letters that move horizontally it would be greatly reduced the number of internet users). Internet gives us the ability to access an enormous amount of information in no time (much better than wasting time in a dusty library and at the mercy of the good will of the library). The network of networks also allows us to connect in real time with any person anywhere in the world, and at the same time gives us the anonymity (to people who have difficulty in establishing interpersonal relationships, the anonymity offered by the net quit any inhibition). Internet gives us the possibility to buy everything without moving from home to face the chaos of a supermarket, and flatters us with the opportunity to earn money working from home without having to face the stressful traffic. The list of the positive characteristics of the net is huge, but I think these are the essentials. No doubt, it is almost impossible to resist the appeal of the Internet. But it’s really worth it? What we become if we spend fifteen hours a day surfing the web? What memory or image will remain of us? Maybe a “nickname”, a beautiful blog or a website lost among the hundreds of millions already existing. Nowadays Internet is a necessity, and exploiting its features to improve our quality of life and grow as persons is totally understandable, but then... where we should place the limits? 1. Increase gradually the hours spent surfing the net. Means that the tolerance level increases, for which you need to pass more hours in Internet to meet your need and feel satisfied. 2. When not connected you have ideas and recurring thoughts about what is happening online. These ideas bother but you can’t get rid of them. 3. Efficacy and dedication to work or study are reduced. Are also appearing difficulties in interpersonal relationships and sexuality. 4. It occurs a substantial change in your interests and personal motivation. Gradually, surfing the Internet becomes the only important motivation and interest for you, the previous interests pass in a second place. 5. Basic needs like eating and sleeping are threatened. 6. “Normal and usual” environmental stimuli lose their attractiveness. 7. When not connected you feel irritable, anxious and uneasy. 8. When surfing the net is no longer just a pastime but becomes a necessity to meet as soon as possible, without worrying about other important objectives. 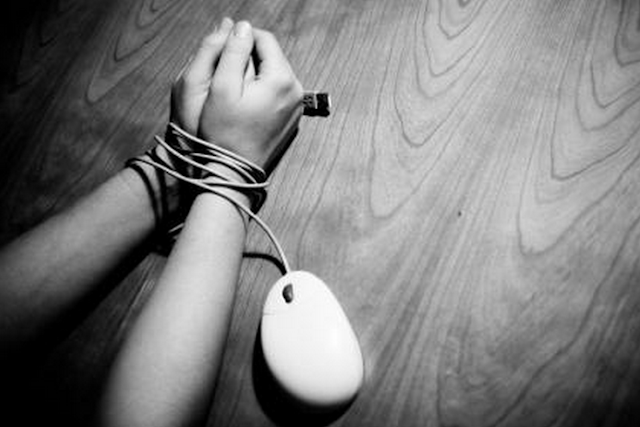 It becomes impossible avoid to surf the Internet, be perpetually connected becomes a necessity to satisfy obsessively. If you think is impossible to get to this level of dependence just look at the statistics that relate how a person out of ten of those online suffer from Internet addiction.